2020Media Review 2019: Is 2020Media a Good Hosting? 2020Media is a hosting company based in London, England with equipment stored at the Telehouse London Docklands Datacenter. They provide valuable hosting service dedicated to small and medium businesses with 24/7 support and redundant network infrastructure. 2020Media is a hosting company located and established in London, U.K. back in the early 1999 and has been a successful provider of online space to small and medium business clients ever since. The company operates using Telehouse London Docklands Datacenter which provides a multi-homed network, meaning the bandwidth is balanced and safe from overloading thanks to multiple internet service providers. The company is also a part of RIPE, which is an internet regulatory institution with a mission to supervise the IP allocation of its members. 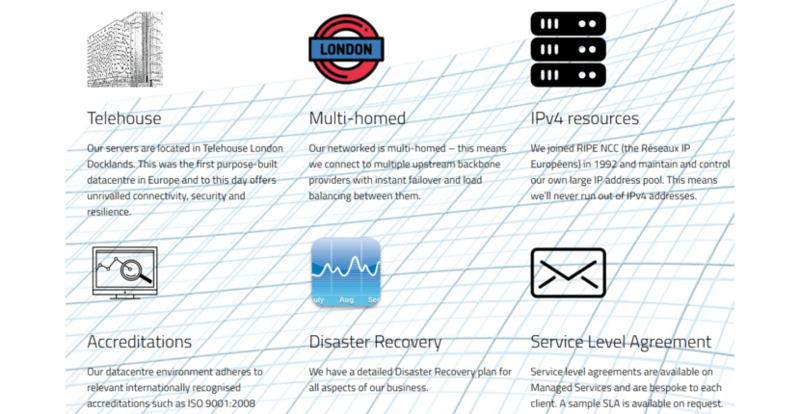 2020Media provides shared, VPS, and dedicated servers hosting to clients with interest in obtaining a U.K. IP address. This means that a website hosted by 2020Media has better visibility and performance to visitors from this country. Their plans are crafted with clients’ needs taken into account, so each plan holds a different value. Shared hosting plans don’t rely on resources, but rather on the number of visits. This means that each shared hosting package comes with a certain number of guaranteed available visits. Their bestselling plan includes the opportunity to host a single website that’s able to receive approximately 25,000 visitors per month. The package also includes a free email account and a free domain name for your website. When you decide to host your website using 2020Media’s services you can choose among various CMSs including the most popular among them WordPress, as well as Joomla, Drupal, and Magento, which is one of the best e-commerce platforms you can find on the market today. Moreover, there are dozens of other free third-party apps that you can install in order to make your website more appealing to visitors and enhance the volume of your business. There are no free SSL certificates, however, if you require one, the company will be glad to meet your request. The backups are regular and automated, and optimal performance of your website is ensured by free DDoS protection, firewall, and redundant power and network system. The fact that 2020Media is part of RIPE also means that the company will never run out of IP addresses. For all those that require Apache servers, 2020Media has prepared a free Tomcat application, which is an open-source software essential for Java-based web applications. Additionally, SLA is available on request, if you need a Service Level Agreement. The prices are displayed in British Pounds so if you’re not accustomed to this currency it will take a conversion in order to establish the price. Once you’ve done that, you’ll soon realize that 2020Media is definitely not the most affordable option on the market. However, if you really need a U.K.-based hosting service with redundant network and solid resources, 2020Media is most certainly not an option you want to miss. Their datacenter capabilities and experience in providing services to clients with specific needs balance the scale between pricing and performance. Another good reason why this company is worth your money is their support service. The company provides non-stop, always-ready customer support via telephone, email, and Live chat app. The service is impeccable and with so much experience there’s almost nothing they can’t cope with. 2020Media offers a standard-issue set of services to its customers for a price which goes above the industry average. However, the performance features, support, as well as 99.99% guaranteed online presence makes the whole deal acceptable. Wondering how 2020Media stacks up against other Web Hosting companies? Enter any other Web Hosting company and we will give you a side-by-side comparison.